Inside: These four printable alphabet mazes are low prep, simple to play and make great alphabet learning games. 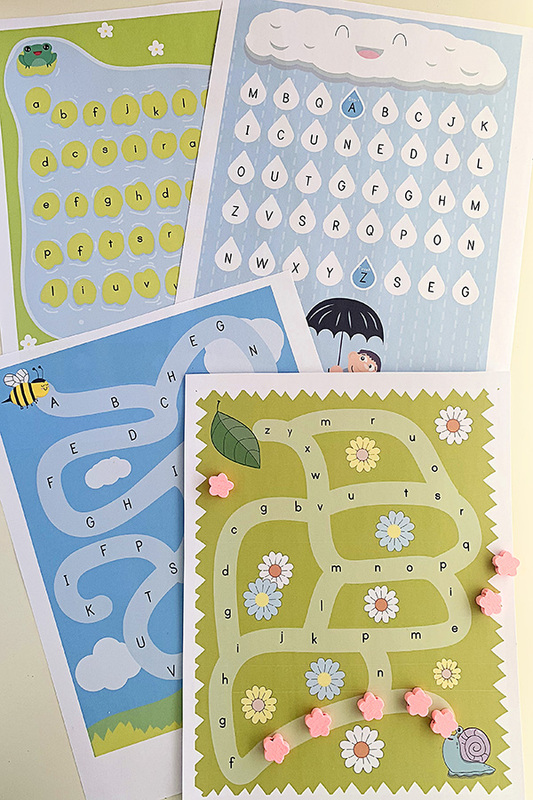 I am so please with how gorgeous these nature themed alphabet mazes turned out. 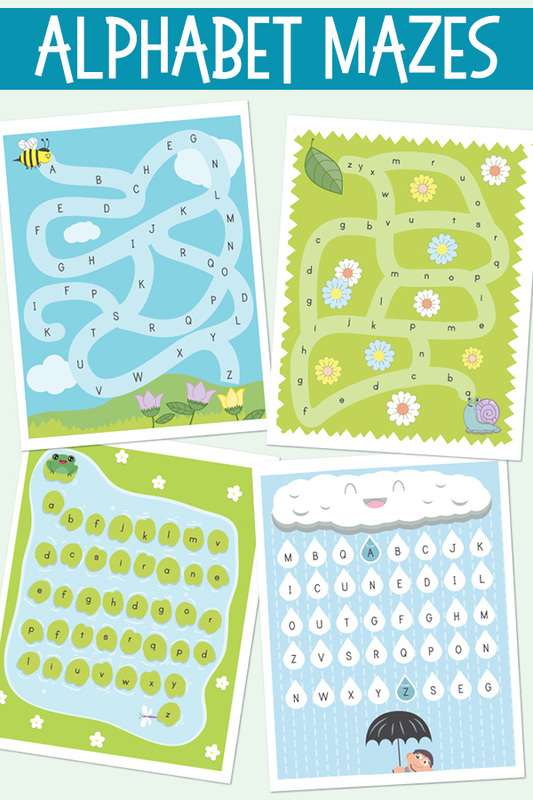 They tie in beautifully with a range of classroom themes – Spring, nature, Earth Day and gardening to name just a few – or can form a lovely standalone alphabet learning game to be used at home or school with preschoolers, first and second graders. To get started you will need to download and print a copy of the letter mazes – the instructions for which can be found at the bottom of this post. You will also need a set of small manipulatives for children to use to cover each letter of the alphabet in the maze. We used mini, wooden flower beads in the photo below. Alternatively, you could use small, clear gemstones, mini erasers or colourful buttons. To complete a maze, the child starts by locating the letter A at the starting point of the individual maze. They cover the A with a gemstone or button, or whatever manipulative you are using. 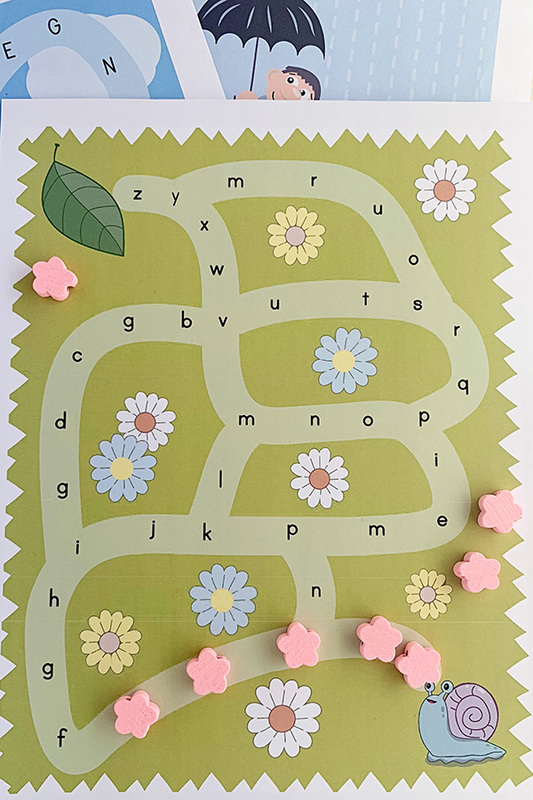 They then find the letter B alongside the A, then C, then D, etc, finding and covering each letter of the alphabet in order to move through the maze, all the way through to Z.
Click here to download: Printable Alphabet Mazes. Save the PDF to your computer. Open the PDF and print the pages you require. When printing, select “Fit to printable area” (or similar) to ensure the page fits with your printer type and local paper size (these have been created at A4 size). I suggest printing onto card stock or matte photo paper. Laminate for durability. Previous post: 35 Earth Day Picture Books for Super Kids Who Want To Save the World!